Every faction offers a completely different play experience, from the wormhole-hopping Ghosts of Creuss to the Emirates of Hacan, masters of trade and economics. These seventeen races are offered many paths to victory, but only one may sit upon the throne of Mecatol Rex as the new masters of the galaxy. 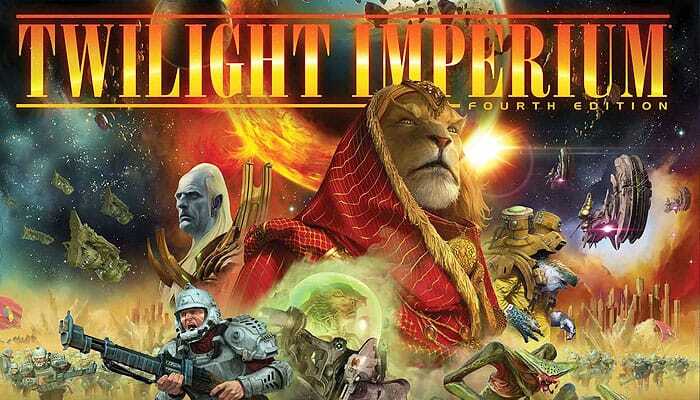 No two games of Twilight Imperium are ever identical. At the start of each galactic age, the game board is uniquely and strategically constructed using 51 galaxy tiles that feature everything from lush new planets and supernovas to asteroid fields and gravity rifts. Players are dealt a hand of these tiles and take turns creating the galaxy around Mecatol Rex, the capital planet seated in the center of the board. An ion storm may block your race from progressing through the galaxy while a fortuitously placed gravity rift may protect you from your closest foes. The galaxy is yours to both craft and dominate. A round of Twilight Imperium begins with players selecting one of eight strategy cards that both determine player order and give their owner a unique strategic action for that round. These may do anything from providing additional command tokens to allowing a player to control trade throughout the galaxy. After these roles are selected, players take turns moving their fleets from system to system, claiming new planets for their empire, and engaging in warfare and trade with other factions. At the end of a turn, players gather in a grand council to pass new laws and agendas, shaking up the game in unpredictable ways. After every player has passed their turn, players move up the victory track by checking to see whether they have completed any objectives throughout the turn and scoring them. Objectives are determined by setting up ten public objective cards at the start of each game, then gradually revealing them with every round. Every player also chooses between two random secret objectives at the start of the game, providing victory points achievable only by the holder of that objective. These objectives can be anything from researching new technologies to taking your neighbor's home system. At the end of every turn, a player can claim one public objective and one secret objective. As play continues, more of these objectives are revealed and more secret objectives are dealt out, giving players dynamically changing goals throughout the game. Play continues until a player reaches ten victory points. Throughout a game of Twilight Imperium, players will barter, plot, and wage war upon one another to complete objectives. The first player to accumulate 10 victory points claims the Imperial Throne and wins the game. This section contains additional rules that players need to understand to play their first game. Throughout the game, players will accumulate action cards. Players can use action cards to resolve powerful one-time abilities. Each player can have a maximum of seven action cards in his hand. If a player exceeds this number, he must choose which seven cards he wishes to keep and discard the rest. This section contains rules for the agenda phase, which is added to the game after a player gains control of Mecatol Rex. The agenda phase involves heavy negotiation and political maneuvering. The custodians token represents the caretakers that safeguard Mecatol Rex until one of the great races can claim the throne. Players may freely move units into the Mecatol Rex system, but cannot land ground forces on the planet while the custodians token is present. After players have played their first game, they should use the advanced rules found in this section. This booklet contains rules for an abridged "First-Game Setup" to facilitate players' first time playing the game. During setup for a standard game, players have a wider array of factions to choose from, many of which are more complex than the factions suggested in the "First-Game Setup".